Shia, also transliterated Shiah and Shiʿah, is a branch of Islam which holds that the Islamic prophet Muhammad designated Ali ibn Abi Talib as his successor and the Imam (leader) after him, most notably at the event of Ghadir Khumm, but was prevented from the caliphate as a result of the incident at Saqifah. This view primarily contrasts with that of Sunni Islam, whose adherents believe that Muhammad did not appoint a successor and consider Abu Bakr, who they claim was appointed Caliph through a Shura, i.e. community consensus in Saqifa, to be the first rightful Caliph after the Prophet. The Buyid dynasty was founded by 'Ali ibn Buya, who in 934 conquered Fars and made Shiraz his capital. His younger brother Hasan ibn Buya conquered parts of Jibal in the late 930s, and by 943 managed to capture Ray, which he made his capital. In 945, the youngest brother, Ahmad ibn Buya, conquered Iraq and made Baghdad his capital. He received the laqab or honorific title of Mu'izz al-Dawla ("Fortifier of the State"). The eldest, 'Ali, was given the title of 'Imad al-Dawla ("Support of the State"), and Hasan was given the title of Rukn al-Dawla ("Pillar of the State"). Ali ibn Buya, known by his laqabImad al-Dawla, was the founder of the Buyid dynasty in Iran. Shiraz is the fifth-most-populous city of Iran and the capital of Fars Province. At the 2016 census, the population of the city was 1,869,001 and its built-up area with "Shahr-e Jadid-e Sadra" was home to 1,565,572 inhabitants. Shiraz is located in the southwest of Iran on the "Rudkhaneye Khoshk" seasonal river. It has a moderate climate and has been a regional trade center for over a thousand years. 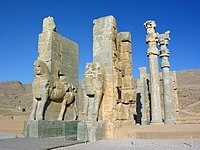 Shiraz is one of the oldest cities of ancient Persia. Fannā (Panāh) Khusraw, better known by his laqab of ʿAḍud al-Dawla was an emir of the Buyid dynasty, ruling from 949 to 983, and at his height of power ruling an empire stretching from Makran as far to Yemen and the shores of the Mediterranean Sea. He is widely regarded as the greatest monarch of the dynasty, and by the end of his reign was the most powerful ruler in the Middle East. 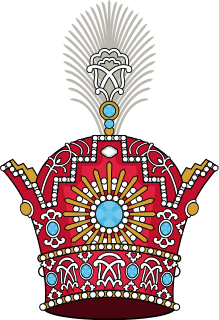 Shah is a title given to the emperors, kings, princes and lords of Iran. It was also adopted by the kings of Shirvan namely the Shirvanshahs. It was also used by Persianate socities such as the rulers and offspring of the Ottoman Empire, Mughal emperors of the Indian Subcontinent, the Bengal Sultanate, as well as in Afghanistan. In Iran the title was continuously used; rather than King in the European sense, each Persian ruler regarded himself as the Shahanshah or Padishah of the Persian Empire. Arabical-ʻarabiyyah[alʕaraˈbijːa](listen) or ʻarabī[ˈʕarabiː](listen) or Arabic pronunciation: [ʕaraˈbij]) is a Central Semitic language that first emerged in Iron Age northwestern Arabia and is now the lingua franca of the Arab world. It is named after the Arabs, a term initially used to describe peoples living in the area bounded by Mesopotamia in the east and the Anti-Lebanon mountains in the west, in northwestern Arabia, and in the Sinai Peninsula. Arabic is classified as a macrolanguage comprising 30 modern varieties, including its standard form, Modern Standard Arabic, which is derived from Classical Arabic. A diminutive is a word that has been modified to convey a slighter degree of its root meaning, to convey the smallness of the object or quality named, or to convey a sense of intimacy or endearment. A diminutive form is a word-formation device used to express such meanings; in many languages, such forms can be translated as "little" and diminutives can also be formed as multi-word constructions such as "Tiny Tim". Diminutives are often employed as nicknames and pet names, when speaking to small children, and when expressing extreme tenderness and intimacy to an adult. The opposite of the diminutive form is the augmentative. Beyond the diminutive form of a single word, a diminutive can be a multi-word name, such as "Tiny Tim" or "Little Dorrit". Abu Mansur Makan ibn Kaki was a Daylamite military leader active in northern Iran in the early 10th century. He became involved in the succession disputes of the Alids of Tabaristan, and managed to establish himself as the ruler of Tabaristan and Gurgan for short periods of time, in competition to other Daylamite warlords such as Asfar ibn Shiruya or the Ziyarid brothers Mardavij and Vushmgir. He alternately opposed and secured support from the Samanid governors of Khurasan, and eventually fell in battle against a Samanid army. Mardavij, was a Gilaki prince, who established the Ziyarid dynasty, ruling from 930 to 935. 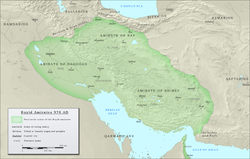 The Ziyarid dynasty was an Iranian dynasty of Gilaki origin that ruled Tabaristan from 930 to 1090. At its greatest extent, it ruled much of present-day western and northern Iran. The death of Adud al-Dawla is considered the starting point of the decline of the Buyid dynasty;  his son Abu Kalijar Marzuban, who was in Baghdad at the time of his death, first kept his death secret in order to ensure his succession and avoid civil war. When he made the death of his father public, he was given the title of "Samsam al-Dawla". 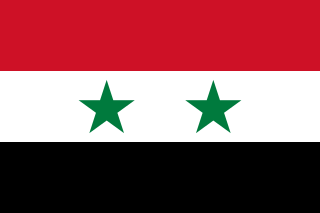 However, Adud's other son, Shirdil Abu'l-Fawaris, challenged the authority of Samsam al-Dawla, resulting in a civil war. Meanwhile, a Marwanid chieftain named Badh, seized Diyabakr and forced Samsam al-Dawla to recognize him as the vassal ruler of the region. Furthermore, Mu'ayyad al-Dawla also died during this period, and he was succeeded by Fakhr al-Dawla, who with the aid of Mu'ayyad al-Dawla's vizier Sahib ibn 'Abbad became the ruler of Mu'ayyad al-Dawla's possessions. Another son of Adud al-Dawla, Abu Tahir Firuzshah, established himself as the ruler of Basra and took the title of "Diya' al-Dawla", while another son, Abu'l-Husain Ahmad, established himself as the ruler of Khuzistan, taking the title of "Taj al-Dawla". The title used by the Buyid rulers was amir , meaning "governor" or "prince". Generally one of the amirs would be recognized as having seniority over the others; this individual would use the title of amir al-umara ,  or senior amir. Although the senior amīr was the formal head of the Būyids, he did not usually have any significant control outside of his own personal amirate; each amir enjoyed a high degree of autonomy within his own territories. As mentioned above, some of the stronger amirs used the Sassanid title of Shahanshah . Furthermore, several other titles such as malik ("king"), and malik al-muluk ("king of kings"), were also used by the Buyids. On a smaller scale, the Buyid territory was also be ruled by princes from other families, such as the Hasanwayhids. Artistic rendering of a Daylamite Buyid infantryman. Buyid era art: Painted, incised, and glazed earthenware. Dated 10th century, Iran. New York Metropolitan Museum of Art. Sayyida Shirin, also simply known as Sayyida, was a Bavandid princess, who was the wife of Buyid ruler of Ray, Fakhr al-Dawla. She was the de facto ruler of Ray during the reign of her son, Majd al-Dawla. Abu Nasr Firuz Kharshadh, better known by his laqab of Baha' al-Dawla was the Buyid amir of Iraq (988–1012), along with Fars and Kerman (998–1012). His early reign was dominated by struggles with his rival relatives over control of the western Persian provinces, but by 998 he managed to establish his supremacy over the Buyid confederation. His reign nevertheless saw the increasing encroachment of neighbouring powers on Buyid territory, and marks the beginning of the decline of the Buyids' power. He was the third son of 'Adud al-Dawla. Shirdil Abu'l-Fawaris was the Buyid amir of Kerman and Fars (983-988/9), as well as Iraq (987-988/9). He was the eldest son of 'Adud al-Dawla. Abu Kalijar Marzuban, also known as Samsam al-Dawla was the Buyid amir of Iraq (983–987), as well as Fars and Kerman. He was the second son of 'Adud al-Dawla. The Abbasids recognized his succession and conferred upon him the title Samsam al-Dawla. He lacked the qualities of his father 'Adud al-Dawla and failed to have a grip upon his state affairs. His rule was marked by revolts and civil wars. 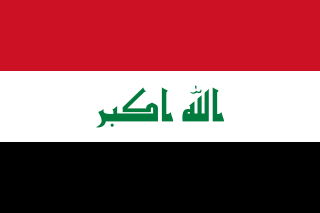 Bakhtiyar, better known by his laqab of ʿIzz al-Dawla, was the Buyid amir of Iraq (967–978). Ahmad ibn Buya, after 945 better known by his laqab of Mu'izz al-Dawla, was the first of the Buyid emirs of Iraq, ruling from 945 until his death. Abu'l-Hasan Ali ibn al-Hasan, better known by his laqab of Fakhr al-Dawla was the Buyid amir of Jibal, Hamadan (984–997) and Gurgan and Tabaristan (984–997). He was the second son of Rukn al-Dawla. Hasan, better known by his laqab as Rukn al-Dawla, was the first Buyid amir of northern and central Iran. He was the son of Buya. Abu Mansur Buya, better known his honorific title of Mu'ayyad al-Dawla was the Buyid amir of Hamadan (976–983), Jibal (977–983), Tabaristan (980–983), and Gorgan (981–983). He was the third son of Rukn al-Dawla. The Batihah was a geographical and political unit in Iraq in the 10th and 11th centuries. It was also known as The Great Swamp or The Marsh. The Daylamites or Dailamites were an Iranian people inhabiting the Daylam—the mountainous regions of northern Iran on the southern shore of the Caspian Sea. They were employed as soldiers from the time of the Sasanian Empire, and long resisted the Muslim conquest of Persia and subsequent Islamization. In the 930s, the Daylamite Buyid dynasty emerged and managed to gain control over much of modern-day Iran, which it held until the coming of the Seljuq Turks in the mid-11th century. Abu 'l-Fadl Muhammad ibn Abi Abdallah al-Husayn ibn Muhammad al-Katib, commonly known after his father as Ibn al-'Amid was a Persian statesman who served as the vizier of the Buyid ruler Rukn al-Dawla for thirty years, from 940 until his death in 970. His son, Abu'l-Fath Ali ibn Muhammad, also called Ibn al-'Amid, succeeded him in his office. Fuladh ibn Manadhar, was a Justanid prince, who served as a high-ranking military officer of the Buyid dynasty. Ziyar ibn Shahrakuya, was a high-ranking Gilaki military officer who served the Buyids. Asfar ibn Kurduya, was a Daylamite officer who served the Buyid dynasty. Abu Ali Hasan ibn Ustadh-Hurmuz, commonly known after his father as Ibn Ustadh-Hurmuz was a Daylamite military officer of the Buyids, and an important figure in the Buyid state during the late 10th century. 1 2 Fereshteh Davaran, Continuity in Iranian Identity: Resilience of a Cultural Heritage, (Routledge, 2010), 156. ↑ Davaran, Fereshteh (2010-02-26). Continuity in Iranian Identity: Resilience of a Cultural Heritage. Routledge. p. 156. ISBN 9781134018314. Middle Persian was now replaced by new Persian as the popular language; and thus, the writings of historians , scientists and theologians of the Buyid court, which were in either Middle Persian or Arabic, were accessible to the vast majority of the Iranians only after translation"
↑ Turchin, Peter; Adams, Jonathan M.; Hall, Thomas D (December 2006). "East-West Orientation of Historical Empires". Journal of World-systems Research. 12 (2): 222. ISSN 1076-156X . Retrieved 12 September 2016. ↑ Grousset, René (2002). The Empire of the Steppes: A History of Central Asia. trans. Naomi Walford. New Brunswick: Rutgers University Press. ISBN 978-0813506272. ↑ Blair, Sheila (1992). The Monumental Inscriptions From Early Islamic Iran and Transoxiana. Leiden: E.J. Brill. ISBN 978-90-04-09367-6. ↑ Goldschmidt, Arthur (2002). A Concise History of the Middle East (7 ed.). Boulder, CO: Westview Press. p. 87. ISBN 978-0813338859. ↑ Bosworth, Clifford Edmund (1996). The New Islamic Dynasties: A Chronological and Genealogical Manual. New York: Columbia University Press. pp. 154–155. ISBN 978-0231107143. ↑ Houtsma, Martijn Theodoor, ed. (1993). E.J. Brill's First Encyclopaedia of Islam, 1913–1936 (Reprint ed.). Leiden: E.J. Brill. ISBN 978-9004097964. ↑ Karsh, Efraim (2007). Islamic Imperialism: A History. New Haven: Yale University. ISBN 978-0-300-12263-3. Bosworth, C. E. (1975). "Iran under the Buyids". In Frye, R. N. The Cambridge History of Iran, Volume 4: From the Arab Invasion to the Saljuqs. Cambridge: Cambridge University Press. pp. 250–305. ISBN 978-0-521-20093-6. Taylor &, Francis (2006). Medieval Islamic Civilization: A-K, index. ISBN 9780415966917 . Retrieved 2 February 2014. Donohue, John J. (2003). The Buwayhid Dynasty in Iraq 334h., 945 to 403h., 1012: Shaping Institutions for the Future. ISBN 9789004128606 . Retrieved 3 February 2014. Kabir, Mafizullah (1964). The Buwayhid Dynasty of Baghdad, 334/946-447/1055 . Retrieved 3 February 2014. Patrick Clawson &, Michael Rubin (2005). Eternal Iran: Continuity and Chaos. ISBN 978-1-4039-6276-8 . Retrieved 3 February 2014. Wilferd Madelung, Wolfgang Felix (1995). "DEYLAMITES". Encyclopaedia Iranica, Vol. BII, Fasc. 4. pp. 342–347.